For the past year and a half I’ve been trying different types of cleansing water solutions, and I’ve got to say, these were all pretty impressive. Some were exceptionally great, some falls short of the standard the others have set, but overall still impressive. 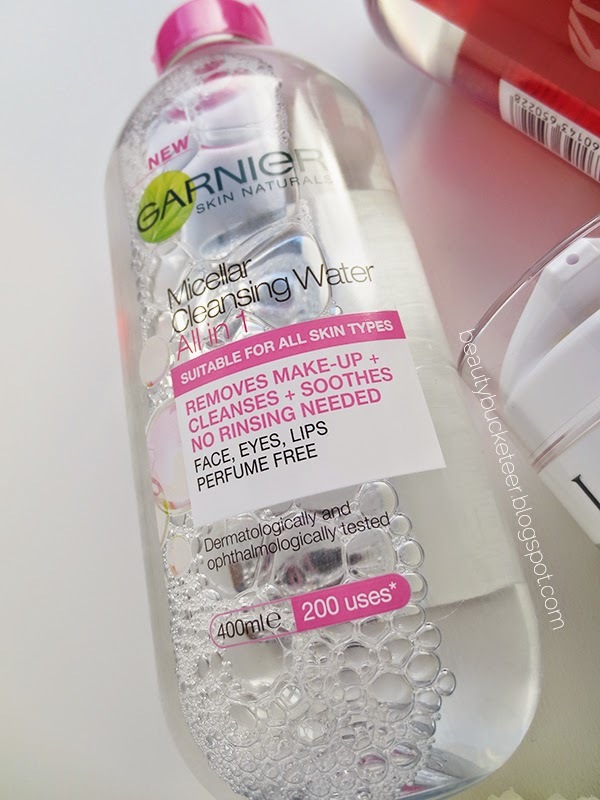 I’ve been using cleansing water solutions to remove my makeup for over five years, but only in the past two years has there been a sudden surge of them in the beauty industry. Ever since the Bioderma gained popularity, lots of companies in the beauty industry suddenly started to produce them too. 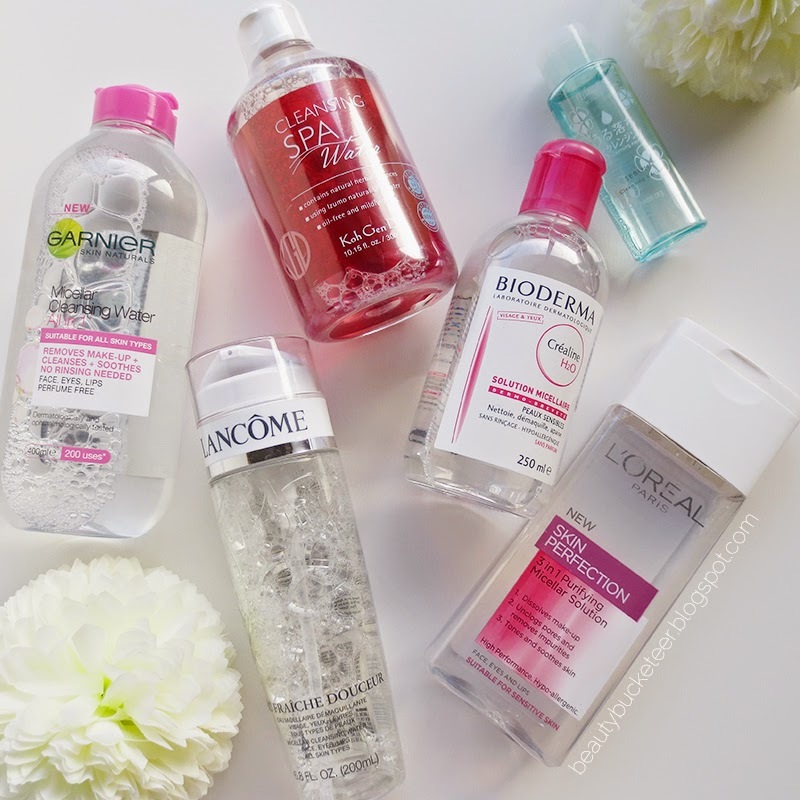 So nowadays we can be overwhelmed by the wide variety of choices we are offered by these companies, whereas five years ago I just heavily relied on my Chanel cleansing water and Bioderma. Since I’ve recently tried my fair share of them, I thought I’d give you guys a quick run down of each of these cleansers to help you decide easier. 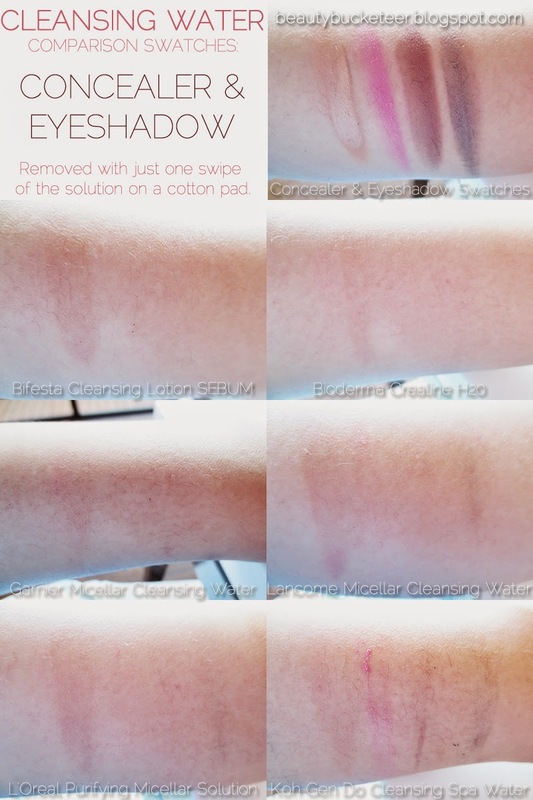 I’ve also included comparison swatches of makeup products removed with one swipe of each solution on a saturated cotton pad for your guidance (click images to enlarge). Urban Decay 24/7 Waterproof Liquid Eyeliner in Perversion (WP). and Bite Beauty High Pigment Pencil in Pomegranate. MAC Paint Pot in Constructivist and Maybelline Color Tattoo in 55 Immortal Charcoal. I let the makeup sit on my arm for about 10-15 minutes before removing them to ensure they’ve settled. The photos above only show the makeup removed with one swipe. I let the saturated cotton pad sit on the makeup for 10 seconds before wiping them. The following review is listed in alphabetical order. 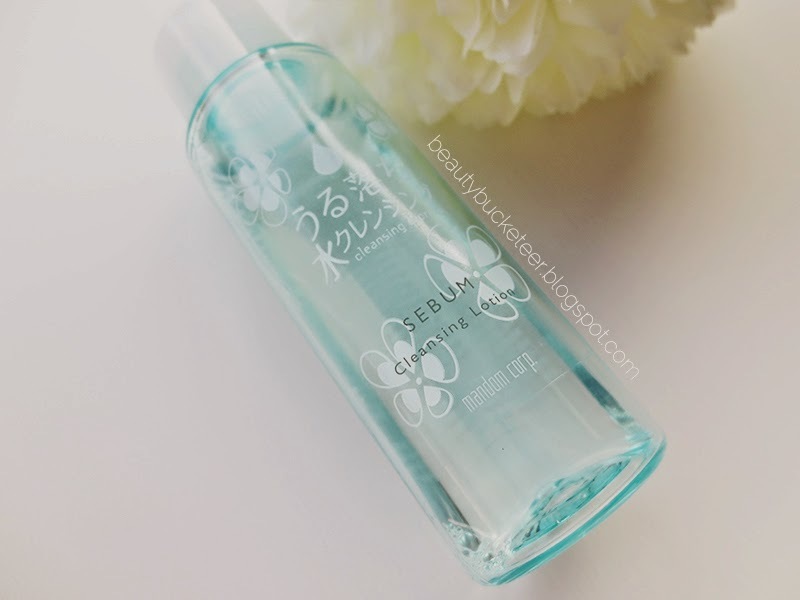 I got this as a gift-with-purchase when I was repurchasing my favorite waterproof eye makeup remover at Watsons in Singapore – the Bifesta Cleansing Express Eye Makeup Remover. 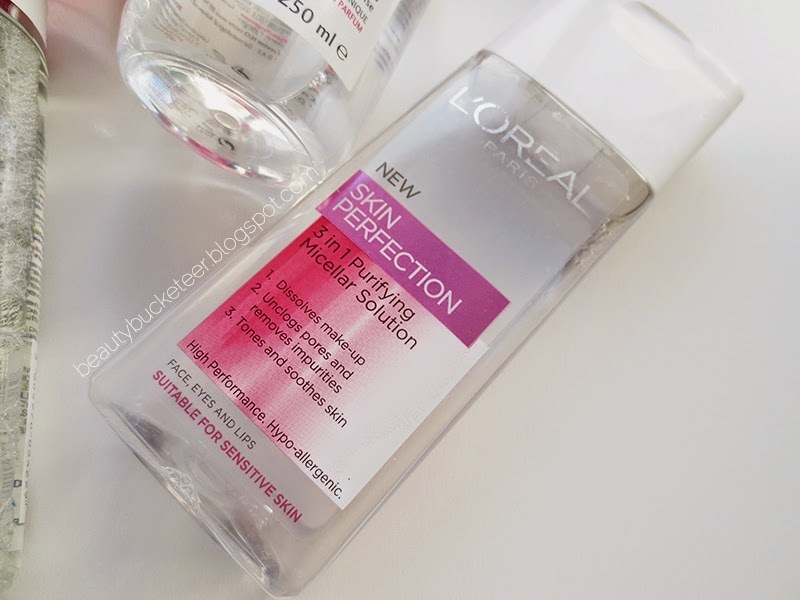 I started using this straight away after I got this in Singapore because the only face makeup remover I brought with me at the time were cleansing wipes and I didn’t really like using cleansing wipes in general, the only reason I had them with me was because they’re easy to travel with. Anyway, I ended up liking this, though not as much as the Bioderma, which is my favorite. This review is for the 50 ml travel sized product. It comes with a screw-on lid and I think it’s great for travelling because screw-on lids are safer and much more secure compared to caps that open and close because they can break and who knows what’s gonna happen if they break. However, when at home, I prefer the latter because they’re easier and faster to open up. Screw-ons take a bit more time to open and close. The plastic bottle itself is pretty damn sturdy! The fact that I’ve tested this while travelling really proves how sturdy it is. No spills, no breaks, no dents. I can’t comment on the original/full-size packaging which comes in a pump because I’ve never owned one, but I do plan on purchasing the full size when I run out of this one. I don’t see anything that could be harmful and it’s completely oil free. This effortlessly removes light face and lip makeup, but it does take a while to completely remove eye makeup. I can only remove eyeliner and lip products after 3 wipes. 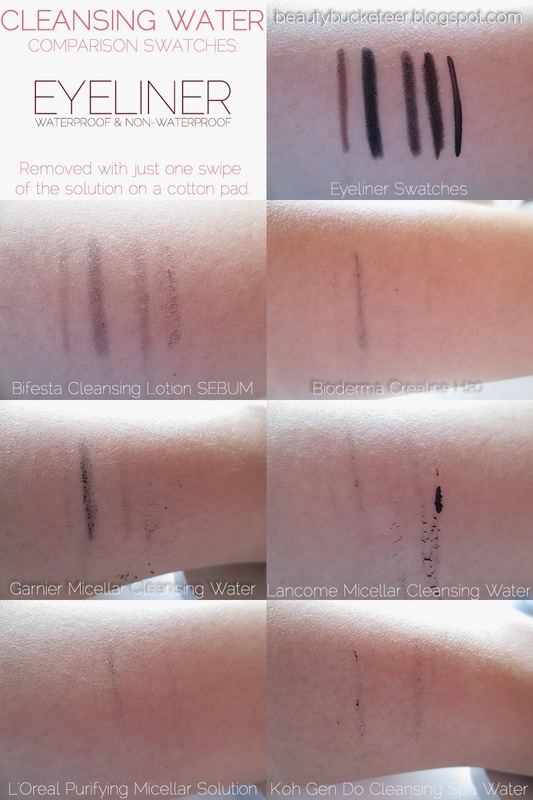 As seen in the swatches above, one swipe doesn’t do much, but I’m glad it’s able to remove everything after 3 wipes because a few others can’t remove the stains at all. This “Sebum” line is designed for people with Combination and Oily skin so it’s perfect for me since I have combination skin, oilier when I’m in tropical countries though. However, this does not seem to irritate my drier skin since I’m now in the midst of the Australian winter. The consistency is a bit thicker than the Bioderma, which basically feels like water, so it feels much more nourishing than the Bioderma but I’m not sure if this is a good thing or a bad thing. I’ve never used this on its own without rinsing so I can’t comment on its solo performance, but the thicker residue it has on the skin makes me feel a bit skeptical about it. I forgot how much I got it for at Watsons in Singapore, but it is approx. 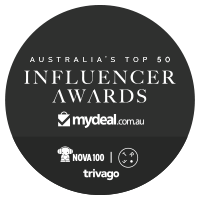 AU$20 on eBay for a full sized 300 ml bottle. I love that this is cheaper than the Bioderma although the quality is quite on par. However I have never tried this on its own as a cleanser, without rinsing it off afterwards, so I can’t comment on that aspect. I would still repurchase this though because it removes makeup really well although it does require some work. This is one of the very first (if not the very first, I can’t really remember) cleansing water I’ve ever used. I didn’t start wearing makeup until I was in my early 20’s (yes, late bloomer!) and even then I never wore heavy makeup. 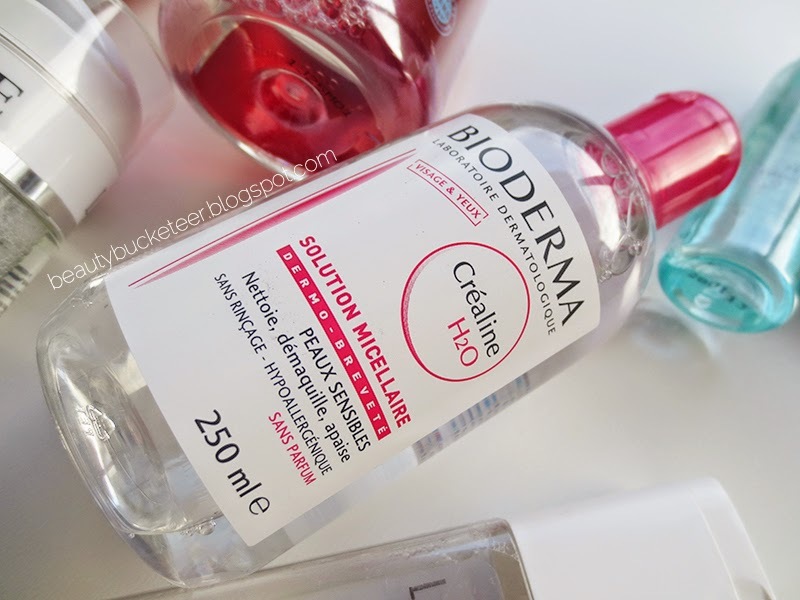 So I loved using the Bioderma. It was recommended to me by a SA at a Sasa or Bonjour store when I was in Hong Kong way back in 2007 or 2008. 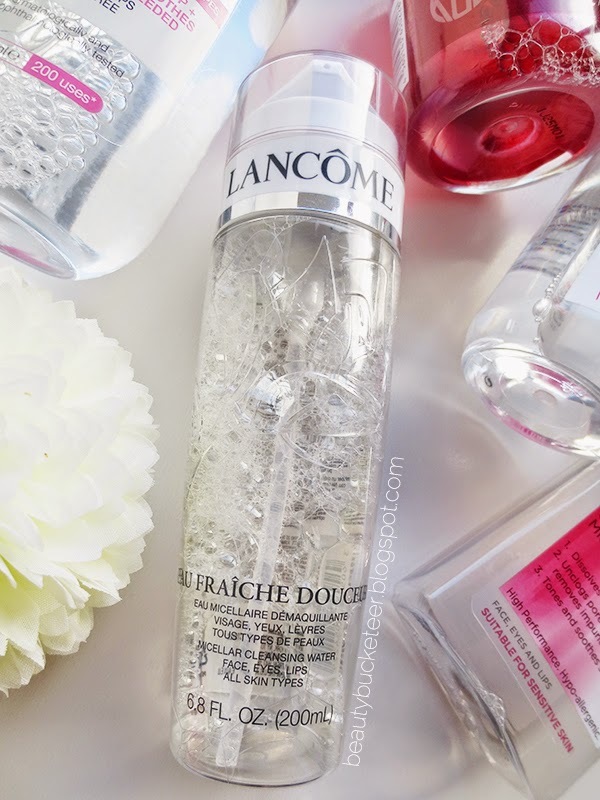 I somehow stopped using this along the way because I was introduced to the Chanel cleansing water (forgot the name!) and I liked it more because it smells so nice (yes it is fragranced) but didn’t irritate my skin. However, ever since the Bioderma became a huge trend in the beauty world I was drawn to it again. I have this in a variety of sizes because I purchased this in France when I was travelling, I wanted one tiny bottle for me to put in my carry on bag, one mid-sized one for my skincare travel bag, and a huge one to use back home. 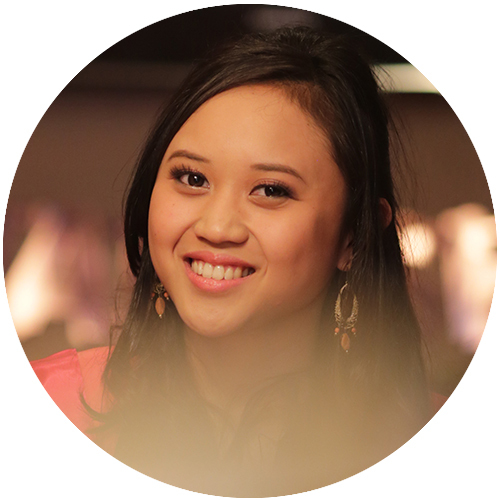 This is one of my favorite aspects about the product – its variety of sizes! Most cleansing waters only come in one, huge size which is very inconvenient. In terms of its packaging per se, I love that it comes sealed and that people won’t be able to open the lid and sniff them in the store. It’s also pretty sturdy – with a tightly sealed cap and strong plastic bottle. I had the mini and mid sized open with me while travelling in Europe earlier this year and I did not experience any leakage. Certainly a pleasure to travel with! I like that this includes cucumber extract, which is very soothing for the skin. It also does not include anything harmful or comedogenic. It is fragrance free which makes it perfectly safe and gentle for sensitive skin. As with all cleansing waters, I use this by saturating a cotton pad with it and wiping it all over the face to remove makeup. When removing eye makeup, most cleansing waters require the cotton pad to be placed over the eyelids for about 10 seconds before wiping it out. With the Bioderma, as long as I’m not wearing waterproof mascara, I barely have to wait until 5. It somehow removes any trace of makeup so effortlessly. I do have to swipe the lashline back and forth a bit to get rid of eyeliner, but I’m not worried about getting the solution into my eyes because it’s very gentle and I don’t even need much pressure, so it won’t tug on my lashes. What I love most about this is that I don’t have to worry about cleansing my face with water after using this. I always remove my makeup with this when I’m travelling by air because I can’t wash my face in the lavatory as the sink water contains so much harsh chemicals, so I rely on this to remove makeup and cleanse my skin without having to worry about it breaking out my skin. As you’ll read on later, this isn’t the case with some of the cleansing waters I tried! I personally got mine in France, and don’t remember the price of the 250 ml (mid sized) bottle. However, the large 500 ml bottle was €19.90 (approx. 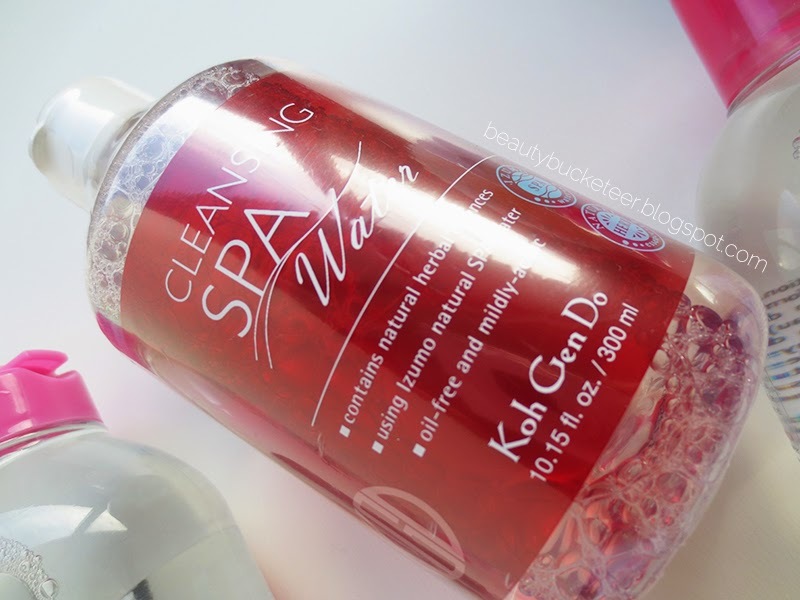 US$26.50) and the mini 100 ml bottle was €6.20 (approx. US$8.25). US Prices: $30 for 500 ml. AU Prices: $40 for 500 ml. Honestly, this one will always be my favorite, along with the L’Oreal. But read on to see what I think about the others! This is the most recent one I got, and the only reason I got it was because it was on sale for less than $8 at my local supermarket. I’ve only used it for about 4-5 times, and I’m honestly not that impressed. It has the worst performance with regards to removing eye and lip makeup, even non-waterproof ones. The packaging is also the worst. It did not come sealed, so people could’ve easily opened up the cap and sniffed the bottle which is not hygienic and honestly grosses me out a bit, but the plastic bottle is pretty sturdy. I’ve never taken this travelling with me (and don’t plan on doing so), so I can’t comment on its durability. This actually has less ingredients than the Bioderma, so I’m guessing it’s very safe for people with sensitive skin. It also says “ophthalmologically tested, which means it has been tested to be safe for the eyes, which means it is very gentle. However, the second ingredient listed, after water, is Hexylene Glycol, which is a type glycol that is known to produce the most severe skin irritations (click here for more information). But don’t worry, glycols in general only cause minimal to mild irritations, so Paula’s Choice has deemed this ingredient to be “Good” (i.e. safe). The other ingredients listed (there are only 7 in total including water and Hexylene Glycol) are perfectly safe. As I said previously, this has the lowest performance. It requires a lot of work in removing even the lightest eye makeup. Don’t even get me started on mascara. It leaves behind quite a significant amount of stain/residue that is so difficult to remove even after several vigorous wiping. When testing the swatches (see images above) I actually had a hard time removing all the makeup residue with this one. I ended up having to use my Bioderma to remove the lipstick stains and some eyeliner stains that this cleanser couldn’t remove. On the packaging, it says “no rinsing needed” which means this can work as a cleanser on its own. So I wanted to experiment and I tried removing makeup and cleansing with this and continued on with toner, serum and moisturizer as usual. I was surprised when I saw two new, shiny, red spots on my cheeks. So, personally, for me, this did not work as a cleanser. Only as a light face makeup remover. I got this on sale for about $7 but the original price is AU$11.99 at Priceline. Although this has been said to be comparable to the Bioderma, it is personally my least favorite out of the bunch and I am glad this was the cheapest. As much as I’d love to love this product for its price, I honestly can’t and will not repurchase because it requires too much work. However, if you don’t mind using an additional eye and lip makeup remover, this is very gentle for the face and removes face makeup really well. The only reason I got this one was because it was on sale for US$29 at a CCO, and it retails for US$38 in Sephora and department stores. The plastic bottle is strong and is sturdy. It comes with a pump, which pumps out the perfect amount of product, so is it very hygienic. As with the Garnier, the second ingredient listed, after water, is Hexylene Glycol but this product contains a bit more ingredients than the Garnier, which I’m honestly a bit skeptical about. It contains Benzyl Salicylate, which is a fragrance ingredient, and also lists parfum/fragrances further down in the ingredient list. The last ingredient listed is rose flower extract. This thing is filled with fragrances! So those of you with skin that is sensitive to fragrances, please beware! This is the most expensive out of the bunch but doesn’t remove makeup as fast as the Bioderma, which is a fraction of the price. As you can see in the swatches, it leaves quite a bit of residue (especially with liners and lipstick) and I had to wipe another 3-4 times to have every single remaining stain removed. Being the most expensive, I expected a lot from this product. However, this turned out to be too heavily fragranced and doesn’t even remove eye and lip makeup well. It removes face makeup like foundation, powder and blush really well though, but my concern is just with the fragrances. This one is only available in the UK, I believe. I’ve been trying to find this in the States and Australia, but I’ve never been able to find them. I hope they will be available here soon because this is the closest thing to the Bioderma that I’ve tried! Worst packaging. ‘Nuff sed. Lid easily opens, doesn’t latch well. Content spilled everywhere when I was travelling because the lid was loose, and so I had to tape it up while travelling which is such an inconvenience. Also, the plastic bottle (top part) cracked a bit, which can sometimes cause a bit of leakage. The plastic bottle is so much thinner compared to the other bottles. This only has 5 ingredients, and contains Hexylene Glycol as well, but never causes irritations on my skin. All other ingredients are perfectly safe and gentle for sensitive skin. Best one compared to Bioderma! 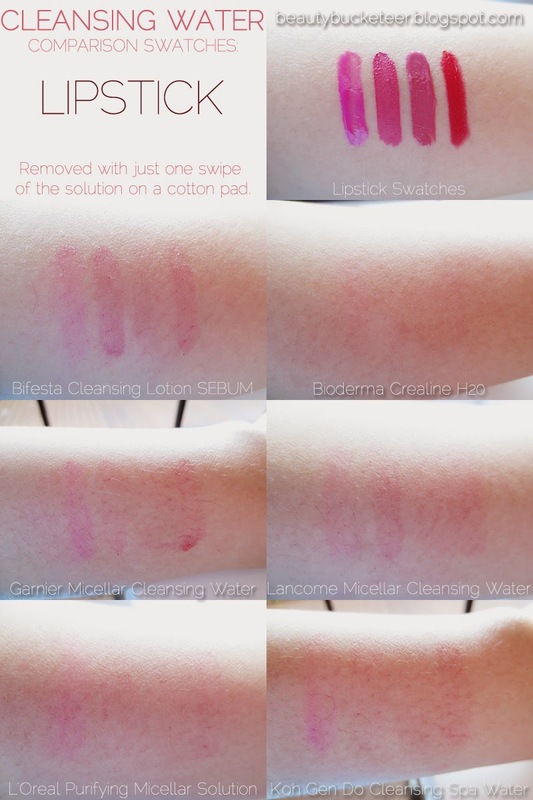 As you can see in the swatch comparisons, this removes a significant amount of makeup with just one wipe! I’ve never used this without rinsing it off though, so I can’t comment on its performance as a toner. £3.33 (approx. US$5.5/AU$6) at Boots. Excellent! One of my top favorites but minus one point for the terribly fragile packaging! Requires double cleansing. Broke me out day after. But otherwise a good makeup remover! This contains Methylparaben which is a type of paraben, a group of preservatives that people tend to avoid due to allegations that they cause breast cancer, and is marked as harmful by lots of people. But the Paula’s Choice reserach team has done significant research to prove against these claims. They’re marked as safe ingredients by the Paula’s Choice team. Click on the infographic below, provided by the FDA, which explains what parabens are and why they are safe to enlarge it. So I’m not too concerned about the paraben in this. However, I am a tad concerned about the essential herbs in this because some people may be sensitive to these plant/herbal extracts. It is a little known fact that sometimes herbs and plants (and purely organic skincare) can cause much more irritation than processed chemicals such as glycerin and dimethicone. I am happy about the Lactic Acid (AHA) and Arginine (Antioxidant) in this though. This probably has the most promising “claims”. On the packaging, it states how it contains natural herbal essence and Izumo SPA water (whatever that is) and that it is oil-free and mildly acidic. I actually really like this one, but only for removing non-waterproof makeup. However, this did cause some irritation when I used it without rinsing. I brought this with me when I was travelling in the Middle East. We were in the Mount Sinai area in Israel and the hotel was horrible, and the water was dirty. We were only there for a night (thank God!) and I had no choice but to cleanse my face with this because I couldn’t use the water to cleanse my face with water (I didn’t take a shower that day too!). So I used this to cleanse with a cotton pad and then just applied moisturizer. I had itching and redness all over my face the next day, the texture of my skin became gritty. Once we arrived at the next destination (a nice resort in the Red Sea), I was able to cleanse properly and my skin went back to normal the next day. Phew! I guess it was all the herbal extracts that drove my skin nuts? US$13 for 100 ml, and US$39 for 300 ml at Sephora. Expensive, but quite nice considering it removes makeup well (although not waterproof makeup). However, this does require double cleansing because the herbal ingredients are too strong not to be rinsed off. So I hope you guys enjoyed my break down of the six cleansing waters I’ve tested, and I hope this will somehow help you decide if you’re not sure which one to get. I know the Garnier one has been getting a lot of hype lately and lots of people out there will disagree with me, but this is just my opinion based on my experience. So I’d love to hear what you guys have to say about these cleansers if you’ve tried them before!